Archimedes was wrong: the tool most people use to move the earth is the mattock. Although often overshadowed by its big brother, the pickaxe, the mattock works on a human rather than industrial scale. You find pickaxes in diamond mines and labor camps, where burley men with short lifespans heave them to gouge precious bits out of the earth and feed multinational corporations. You find mattocks in backyards, where everyday gardeners and homeschooled kids sculpt the soil into strawberry pyramids, herb spirals, and swales that catch rainfall and regenerate life. In Future Scenarios: How Communities Can Adapt to Peak Oil and Climate Change, permaculture guru David Holmgren argues that ecological solutions on the energetic and geographic scale of corporations and nations (“brown tech”) are doomed to devolve to lifeboat scenarios, when their mining of energy to feed themselves rather than people crashes the ecosystems upon which these hierarchies depend. Simpler solutions at the village and township scale offer our best shot at making it to the 22nd century, because larger farm machines fail not only energetically, but psycho-socially. The carrying capacity of the earth is directly linked to the caring capacity of the beings that tend it. The “earth stewards” of Holgrem’s ideal future would be well served to find a blacksmith with enough iron ore to make them a collection of mattocks. 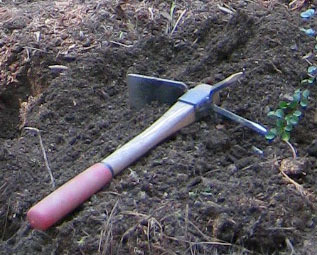 A mattock is a tool not only for moving the earth, but for moving the human heart closer to it.